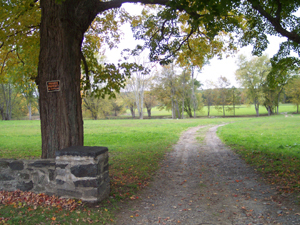 From the beginning of English Marker in Lancaster Massachusetts settlements in the New England colonies, there were skirmishes, attacks, pillaging, abductions, battles, and, of course, wars: Queen Ann's War, King William's War, the French and Indian War, and King Philip's War. The last, which took place from 1675 to 1676, was the bloodiest, but it has been almost completely ignored by history textbook writers. Between six hundred and eight hundred English died in battle during King Philip's War. Measured against a European population in New England of perhaps fifty-two thousand, this death rate was nearly twice that of the Civil War and more than seven times that of World War II. 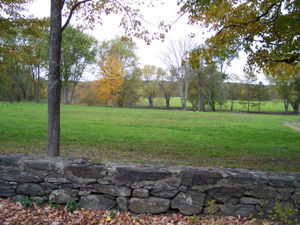 Rowlandson family farmland The English Crown sent Edmund Randolph to assess damages shortly after the war and he reported that twelve hundred homes were burned, eight thousand head of cattle lost, and vast stores of foodstuffs destroyed. Thousands of survivors became wards of the state, prompting churches in England and Ireland to send relief ships to New England's aid ... For all their suffering, the English fared well compared to New England's Native American peoples. 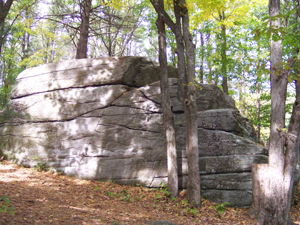 During the war, the English attacked and massacred Narragansett and Wampanoag at the Great Swamp in South Kingstown, Rhode Island, along the Connecticut River in present-day Turner's Falls, Massachusetts, and in locations as separate as the Housatonic River in western Massachusetts and the Pawtucket River north of Providence. Some of the most grisly executions were of native women and children trying desperately to flee the war or surrender. One account estimated that three thousand Native Americans were killed in battle. In a total population of about twenty thousand, this number is staggering. We are discovering that several of our ancestors, unsurprisingly, were greatly affected by the war. 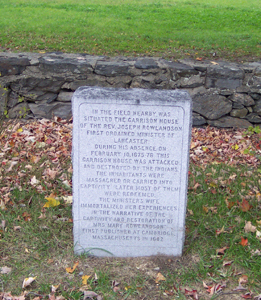 The first minister to the small village of Lancaster Site of Rowlandson farmhouse in Massachusetts was John Rowlandson, who lived on a farm with his wife Mary and their children. Near the beginning of the hostilities, Mary and her infant were captured and carried off by Indians. Her baby died and her two older children were separated from her. She lived with the Indians for three months before being rescued by John Hoar. She told her story in The Narrative of the Captivity and Restoration of Mrs. Mary Rowlandson, which became widely popular in the months following the end of the war. Her story reveals her practical character. Even though she and the baby were wounded (shot by the same bullet during her capture) she kept up with her captors as they fled and made herself useful. She, like all other colonial housewives, carried her sewing kit with her, so she was able to mend and sew garments for her captor, thus increasing her own value. John Hoar was entrusted with the mission of ransoming Mrs. Rowlandson. With two Indian escorts, he arrived at the campsite. The Indians attempted to frighten him by shooting near his horse, by shouting threats and making menacing gestures. He had brought food for a feast dinner, as well as tobacco -- a gift for Mary Rowlandson from her husband, which she sold to the Indians. During the next two days, negotiations for Mary Rowlandson's release continued, until finally, with the aid of a pint of liquor, and the encouragement of a majority of the sachems meeting in council, the deal was made. John Hoar and Mary Rowlandson rode out of the Indian camp. Redemption Rock At sundown they came to the Rowlandson farm in Lancaster where she found that most of the town had been burned and all the occupants had fled. The following day John Hoar completed his mission, returning Mary Rowlandson to her husband in Concord where he had been waiting. John Hoar is Elsa's seventh-great-uncle. The rescue of Mary Rowlandson landed John Hoar in the history books, but the rest of his life is fascinating as well. In an excellent article (New England Ancestors, Fall 2005, pages 53-54), Diane Rappaport follows the career of this man -- "the feisty lawyer spoke his mind no matter how powerful his adversary". Convinced that the local Massachusetts justices were corrupt, he attempted to bring a complaint against them. For this he was punished. He was fined and forbidden to practice law in the colony. It is probable that he accepted the mission to ransom Mary Rowlandson because he needed the fee. Later, toward the end of the war, a half-dozen Indians were murdered near his home. 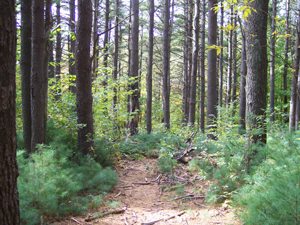 His son, Daniel Hoar, Forest near Redemption Rock was tried and convicted of the murder, but was pardoned at the last minute. We can only imagine the effect testy, stubborn, courageous John Hoar had upon the captors of Mary Rowlandson. Lepore, Jill. The Name of war: King Philip's War and the origins of American identity. Knopf, 1999. Schultz, Eric and Michael J. Tougias. King Philip's war: the history and legacy of America's forgotten conflict. Countryman Press, 2003. Rowlandson, Mary, The Narrative of the Captivity and Restoration of Mrs. Mary Rowlandson Various editions. Bodge, George M. Brief history of King Philip's war, 1675-1677: including supplemental material from soldiers in King Philip's War. various editions. Originally privately printed, 1891. Note: This book is anexample of the school of historical narrative which glorifies the winning side, speaking of the Indians as savages and emphasizing the bloody deeds of the soldiers. It is, however, generally considered the most complete description of the war. Church, Benjamin. Entertaining passages relating to Philip's war. originally published in 1716. To hear Church tell it, he was the greatest single hero of the war.